Friends is leading a multi-year restoration effort to preserve and interpret the Castro Adobe new as a State Historic Park in partnership with California State Parks. It is Santa Cruz County’s second State Historic Park and the first non-beach State Park in the Pajaro Valley. The Castro Adobe is open on a limited basis for special events, such as Open House Days. Friends undertook the restoration of the Castro Adobe in order to preserve and interpret for the public the only remaining building of the Rancho era in the Pajaro Valley. The Castro Adobe is one of the finest examples of a rancho hacienda in the Monterey Bay area. It is an excellent representation of a Monterey-Colonial adobe and is an important example of Northern California’s Rancho Period. Castro Adobe State Historic Park will serve visitors interested in adobe architecture and preservation, as well as fourth graders studying the Mexican Rancho Period and third graders studying local history. In the cocina (kitchen), the link between Latino traditions of today and our Californio heritage will be tangible as students experience tortillas, beans and nopales (cactus), which were eaten in the Rancho period and are still enjoyed today. The Edna Kimbro Library and Archives – Center for Early California Studies will be opened to serve scholars and other visitors interested in the study of the cultural heritage of early California. Private tours and school visits are available. The tour and activities at the Rancho San Andrés Castro Adobe State Historic Park last approximately 2.5 hours. This can vary to accommodate the needs of the individual class or group. Learn more in this Castro Adobe Fact Sheet, follow the restoration efforts in the Castro Blog or come visit at one of the many Castro Adobe events in 2019. For more information, call 831-429-1840 or email castroadobe@nullthatsmypark.org. The Rancho San Andrés Castro Adobe is one of the grandest of all adobe buildings representing the Mexican Rancho Period of California history (1821-1848). The Rancho period began as Mexico first gained its independence from Spain and ended when California became part of the United States. Mission lands were secularized during this period and families such as the Castros were granted large swaths of land to build on and use for ranching. Located near Watsonville, this two-story adobe hacienda features a spacious fandango room on the second floor and an original cocina, one of the very few remaining original rancho cocinas in California. The original carreta (cart or wagon) road to the adobe is still in use, providing a tangible link to the history of the site. Here is a timeline of the Castro Adobe. The Castro Adobe was built between 1848-1850 by Juan Jose Castro, son of Jose Joaquin Castro, who was an original Juan Bautista de Anza Expedition member. Juan Jose built the Castro Adobe on the family’s land grant, Rancho San Andrés. The rancho spread over two square leagues (8,800 square acres) stretching from the Monterey Bay to Corralitos and from the Pajaro River to Aptos. Eventually the extended Castro family owned over 250,000 acres from Pajaro to Aptos to Soquel and north almost to Davenport. Castro family raised cattle for trading hides and producing tallow at the two-story adobe and on the surrounding land. They enjoyed fandangos on the second floor, as food was prepared on the long brasero (masonry range) in the cocina. The fandangos featured dancing, music and food to entertain the Castro family and friends. The family fished at nearby beaches, caught frogs in the sloughs, and ate meat from the cattle, sheep and goats they raised. Prickly pear hedges provided nopales to eat and formed fences to keep the livestock out of the fields. To lighten their work, the Castros had oxen and mules to plow the fields, barns for storage and livestock shelter, and fields of wheat, corn, beans and potatoes. The family hired Native Americans to construct the adobe and do most of the work inside and outside, including grinding the corn and wheat for tortillas and helping with the livestock at the rancho. The house, with sweeping eastward views, offered plenty of room for fiestas and overnight guests. The adobe overlooked the road from Jose Amesti’s redwoods to the Castro embarcadero (wharf or landing), where lumber was shipped out. The adobe was built one room deep, so the sunshine could penetrate the rooms from two sides brightening the otherwise somewhat dark, cool rooms. The Castro Adobe cocina (historic kitchen) is significant as one of the few remaining original Rancho cocinas in California. Restoration of the cocina will allow visitors to experience daily life at a Mexican rancho, including food preparation in the cocina and women’s roles in Californio culture, as well as overall life at the Castro Adobe including how the family used the building and site. Project team additions including renowned adobe conservation architect Anthony Crosby, to guide the restoration project, and noted structural engineer, Fred Webster, an authority on seismic performance of historic adobe structures. Archeological investigation of the interior of the cocina, including position and placement of original brasero, as well as investigation of the floor to determine original earthen floor composition and location. Installation of a new roof and historically accurate earthen floor. Painstaking removal of all non-historic latex paint on adobe walls. Construction of a reproduction brasero. Restoration of wall finishes, using mud plaster. Concealment of steel material utilized in seismic upgrade. Final structural stabilization of the north cocinawall and roof system. Installation of electrical service to provide ambient lighting and interpretive exhibits. Development of an Interpretive Plan and installation of interpretive panels. Development of a historically accurate Furnishing Plan and furnishing of the cocinawith historically accurate cooking implements, reproduction food items and furniture. Located to the west of the adobe, the Potter-Church Garden was constructed from 1968-1972, when the property was owned by David and Elizabeth Potter. The Potters were close friends with landscape architect Thomas Church, who consulted on the design of the garden and provided on-site sketches. Church is significant as the founder of the modern movement in landscape architecture known as the “California Style.” He completed master planning for UC Berkeley, UC Santa Cruz and Parkmerced in San Francisco, as well as countless residential designs. The garden provides a central gathering place for group tours and special events. Friends restored the garden, following Thomas Church’s original design. The garden was thoroughly researched and analyzed in the report, “Garden Restoration Report for the Potter Garden,” prepared in 2011 by Pam-Anela Messenger, landscape architect and Thomas Church expert. In the report, Messenger detailed the evolution of the garden and identifies significant plant and tree species. She also developed a template and landscape plan to enable restoration of the garden. The Potter-Church garden is a unique outdoor space created by a landscape architect of national significance. The garden helps tell the story of later owners of the adobe and their stewardship of the site through 1988. Landscape contractor Laura Livingston and landscape designer Kathleen Schaeffer were hired by Friends to restore the Potter-Church Garden. Restoration work included landscaping, paths, drainage and irrigation, lighting, fence and gate repairs. Work was completed in 2015. In 1989, the Castro Adobe was seriously damaged by the Loma Prieta Earthquake, ending its use as a private residence. The north cocina wall was severely damaged in the earthquake and careful evaluation concluded that the wall must be reconstructed. Many adobe bricks were needed to complete the reconstruction of the wall. In the summer of 2007, under the leadership of Friends board members and Project Manager Jessica Kusz, Friends partnered with adobe brick-making expert Tim Aquilar and began the process of making 2,500 bricks, each measuring 14 inches x 28 inches and weighing approximately 85 lbs. Because it was critical to ensure that the new adobe bricks were compatible with the existing adobe bricks, testing of existing adobe bricks was done to reveal the sand, silt and clay content. After significant research by the project team to identify the right local dirt choice to match the existing adobe bricks, Rick Santee, owner of Santa Cruz County-based Central Home Supply, was selected as the supplier. The first 40 yards of dirt was delivered July 27, 2007. The brick-making project relied on a force of more than 150 volunteers, aided by California Conservation Corps workers. After being formed, the bricks had to be lightly watered daily to ensure a slow drying process. Neighbors assisted with this task. After about 20 days, when the bricks were stable, the curing process required the bricks to be turned on their sides, an arduous task due to the weight and fragility of each brick. Despite this, among the 2,500 bricks that were produced only 14 percent suffered breakage. The finished bricks were used to restore the adobe. The second floor is significant for its use during fandangos. For Californios, the fandango was a major social event, at which family and friends danced, played music and enjoyed lavish feasts during the Rancho era. In order to accommodate visitors, the second floor requires stabilization and access improvements. Restoration architect Tony Crosby and structural engineer Fred Webster worked to increase the load capacity through installation of a single steel beam in the first floor rooms that will extend the length of each room to support second story floor joists. The purchase and installation was completed in 2016. To increase access to the second floor, a lift will be installed. The lift will be installed in Summer 2016. The Castro Adobe lift project is considered to be a model for other two-story adobe buildings because the design allows access for all while maintaining interpretive qualities of the site. 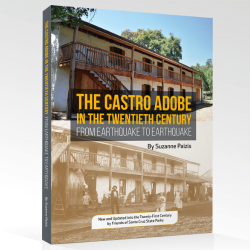 Writer, historian and one-time Castro Adobe owner Suzanne Paizis traced the history of the Castro Adobe and the many families who called it home from 1906–1989, compiling her research in The Castro Adobe in the Twentieth Century: From Earthquake to Earthquake, the unrivaled chronicle of the property and its inhabitants. Working with respected writer Traci Hukill, Friends commissioned an update to the original book in partnership with Bookshop Santa Cruz. In the second edition, nine new chapters pick up after the Loma Prieta Earthquake to tell the unlikely story of how a grand old adobe, fallen on hard times, is being reborn as the Castro Adobe State Historic Park with help from Friends of Santa Cruz State Parks, California State Parks and a community of passionate grassroots supporters. The book is available online, at all ParkStores and at Castro Adobe open house events. Cost is $29.99 and all proceeds benefit the Castro Adobe.